Welcome to Federal Point Yacht Club and Marina in Carolina Beach! Federal Point Yacht Club was established in 1996 as a private, waterfront yacht club located along the Carolina Coast in the heart of Carolina Beach. The clubhouse and marina offer stunning views of magnificent yachts, the Intracoastal Waterway, Sunrise Bay and the beautiful Yacht Basin. Members of Federal Point Yacht Club enjoy a unique and casually elegant life experience offering rich history and tradition, exceptional facilities, uncompromising service and gracious hospitality. Federal Point Yacht Club is located within easy reach of Wilmington International Airport (ILM) and only a 12-mile drive to the airport. Our yacht club is located just a few blocks from Carolina Beach historical Boardwalk, beautiful uncrowded sandy beaches, shopping and great restaurants. Members may come for the magnificent setting and exceptional amenities, but they stay for the enduring friendships, sense of community, congenial warmth and relaxed atmosphere. Experience life, just better - at Federal Point Yacht Club! Located in the Carolina Beach Yacht Basin and right in the heart of Carolina Beach, Federal Point Yacht Club is located within a pristine neighborhood of beautiful homes that have lots of southern charm. We offer a variety of guest services, boat slip rentals and gorgeous views of the Intracoastal Waterway and Yacht Basin Harbor. Check out our affordable boat slip rental prices. You won't find a better place for your boat! Federal Point Yacht Club offers boaters the opportunity to rent a boat slip at our marina. We offer daily, weekly and monthly boat slip rental programs. Federal Point Yacht Club offers the finest in an upscale boating community with all of the amenities you could want or need. We are close to shopping-restaurants and entertainment. Carolina Beach offers a variety of fun and exciting things for you and your family to do. Contact us to learn more about how you can rent a boat slip at 910-458-4201 or Email Us to learn more. Federal Point Yacht Club now offers you the opportunity to list your boat slip for sale on our website. You can place an ad any time. Once approved, it will be shown under our classifieds until you sell the slip. You can pictures to. All potential buyers may also contact the Federal Point Management Office to make an appointment to come take a tour of the Marina and view individual slips and their locations. All slips come with a Federal Point Yacht Club Membership!! You may also refer to the photo album titled "Marina" for updated pictures of the Yacht Club and Marina! Please contact Deborah or Rita for more information or with any questions or inquires. Our office hours are Monday thru Friday from 10am to 5pm. Plan your summer vacation at Pleasure Island, home to some of the most beautiful North Carolina beaches. Enjoy the sand, surf, and our quaint, historic beach towns of Carolina Beach, Kure Beach, and historic Fort Fisher. Come for the day, a weekend getaway, or a long beach vacation. You're sure to discover why the summer never ends on Pleasure Island! You'll find everything you need to create your own custom itinerary for your Pleasure Island trip here on our site. Check the Event Calendar to see what's happening on the island. Find out Where to Stay and book your reservations now. Then choose ideas for Where to Eat, Where to Play, and any Local Services you might need along the way. We've got all your Pleasure Island vacation planning right here! 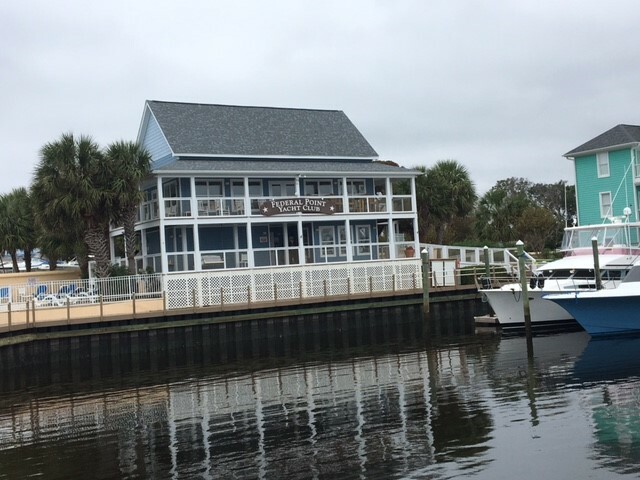 Federal Point Yacht Club & Marina located on the Carolina Beach Yacht Basin, is happy to provide visiting boaters with helpful boater information about our area. Here you will find access to information about the areas boat harbor facilities, local current weather conditions, and many more important boater resources you might need while visiting Carolina Beach and the Federal Point Yacht Club and Marina. We hope you find this Boater Resource section helpful and if we've missed something important to you, please let us know and we will add it. Our boater directory offers a list of links of supplying services, equipment and supplies to boaters updated for your convenience as well as many boating related links. If you offer boater services and you you would like to be added to our directory, please contact the Federal Point Yacht Club dockmaster directly. The office phone number is 910-458-4201. The cell number is 910-458-4511. The wireless network at Federal Point Yacht Club has been upgraded to a 5.0GHz enterprise level network in order to address the 2.4GHz heavy traffic at the marina which was causing slowness and buffering for many of our guests. If you have devices that will not connect to the faster 5.0 speeds, We use "Your Computer Friends" company, they can install a mini network on your boat to bring your signal to your boat and then drop it to 2.4GHz so that your devices can receive it and then rebroadcast it to your equipment only. Think of it as a home network for your boat, it will not be public. This local network will work with other 5.0GHz networks and the equipment is owned by you. We are concentrating on making our website “FPYClub” a focal point for members as well as a source of information for our local boating community. We will be offering a newly revised “Slips for Sale” section along with updated information. If you are interested in listing a slip, contact the office. Emails for staff are: Deborah Conard Deborah@fpyclub.com and Rita Hartsfield CMM@fpyclub.com for any requested dock repairs or issues, general office related questions and comments. Rita our office assistant, will also be answering your emails as well as your phone calls. We also have a request as we strive to increase the efficiency of our office. If you do not have a current certificate of insurance on file in the office, please send one to us a.s.a.p, We are in the process of updating information in member and renter files and need the certificate to complete the task.